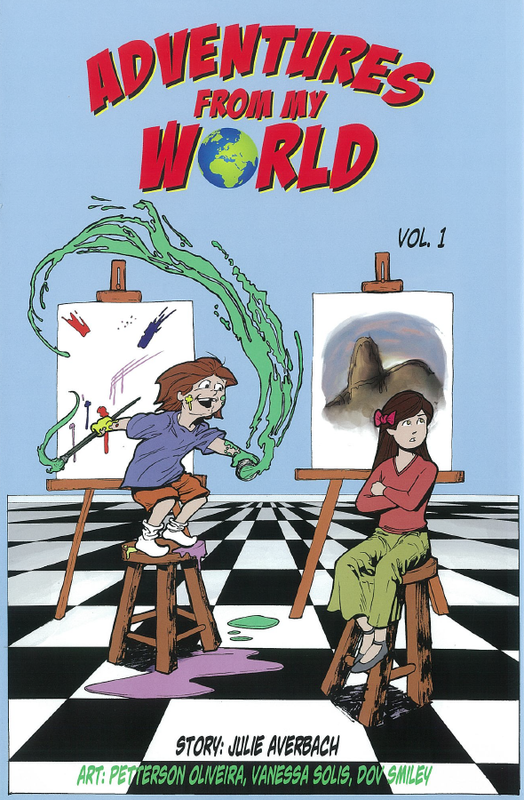 Written to help support and raise awareness of special needs siblings, Adventures From My World is the brainchild of teenager Julie Averbach and features artwork from Kubert School graduates Petterson Oliveira, Vanessa Solis and Dov Smiley. Designed to help let siblings of individuals with special needs know that they’re not alone in their experiences, the book is made up of a series of strips featuring the type of situations that can be encountered frequently with a special needs brother or sister. Over the course of this collection, we meet several youngsters, revisiting their lives several times and seeing some of the issues they have to deal with, from a perceived lack of parental affection to a struggle with balancing their homework and after-school activities with the added responsibility of having to look help after their sibling. A lot of the strips here aren’t necessarily complete stories as such, but instead provide snapshots of situations that special needs siblings the world over will instantly recognise. Averbach highlights a situation, shows its impact on the youngster, and then – more often than not – ends the strip, leaving the follow-up as an ongoing discussion point. It’s this approach that really makes Adventures From My World work, in my opinion. Averbach isn’t trying to wave a magic wand and solve everyone’s problems, but is instead simply looking to raise awareness of these issues and, hopefully, prompt an ongoing dialogue about how to manage and minimise their impact. The stories vary in style and severity, from high schooler Ivywhose mother is forced to dedicate so much of her time and attention on her special needs sister that she finds herself retreating completely, not even wanting to let her parents know when she gets good grades, to Max, who finds himself accidentally snapping at his special needs brother when the pressures and frustrations of his own life become too much to bear. It’s not all sacrifices and awkward discomfort though, as Julie is also quick to point out the benefits of special needs siblings, particularly in “Letter to my Brother”, an incredibly touching strip which serves as a letter from teenager Abby to her special needs brother, telling him all the ways he has improved and enriched her life. The artwork is polished and expressive throughout, with Oliveira, Solis and Smiley each adding their own distinctive style to Julie’s words while keeping things bright and accessible. There can often be a stigma attached to the relatives and carers of special needs children, whereby there seems to be a preconception that they should bear their burden in graceful silence and never show any signs of weakness or frustration. It’s this barrier in particular that Averbach is trying to break down, and by showing the all too real sacrifices and frustrations of these siblings, as well as prompting discussion of their issues, it’s hopeful that her creation can help make some of these youngsters’ lives just a little bit happier. All that aside, perhaps the greatest indication of the success of Adventures From My World (rather than, y’know, a good review from BCP), is the fact that it’s now being used as a learning resource in a variety of different centres and hospitals all over America, and – hopefully – is doing exactly what its author intended by helping special needs siblings realise that, as bad as things can sometimes get, they’re not alone in their experiences. You can buy a copy of Adventures From My World from the official website by CLICKING HERE.